A recent study of 40,000 farms in over 100 countries concludes that of all the individual acts a person can do to try to reduce their impact on the environment, giving up meat in one's diet is the biggest way to help the planet. In addition to deforestation, extinction of wild animal species, and greenhouse gas emissions, meat farming, especially farming of beef and pork, is lousy for water. Animal wastes pollute streams, rivers, and ultimately oceans, and large amounts of water are required to make a pound of beef, although there seems to be wide disagreement over exactly how much water — claims range from 450 gallons to 250 gallons of water per pound of beef depending on the farming methods used. To be clear, I myself am not a vegan eater. I rarely eat red meat, but I do eat fish and sometimes poultry. I also eat dairy, cheese, and eggs. I could picture myself giving up meat altogether, but I'm very attached to cheese and eggs. I'm not sure what, if anything, would convince me to stop eating those things. This print is a reduction print (carve, print a color, carve some more, print another color…). I'm trying to loosen up my process a bit by utilizing only one block, a limited palette, working in small editions, and not doing so much pre-planning. It's fun. I am fascinated by your water series. It is intellectually engaging and provoking - conceptually challenging. The series together - so far, anyway - will certainly have attracting impact. 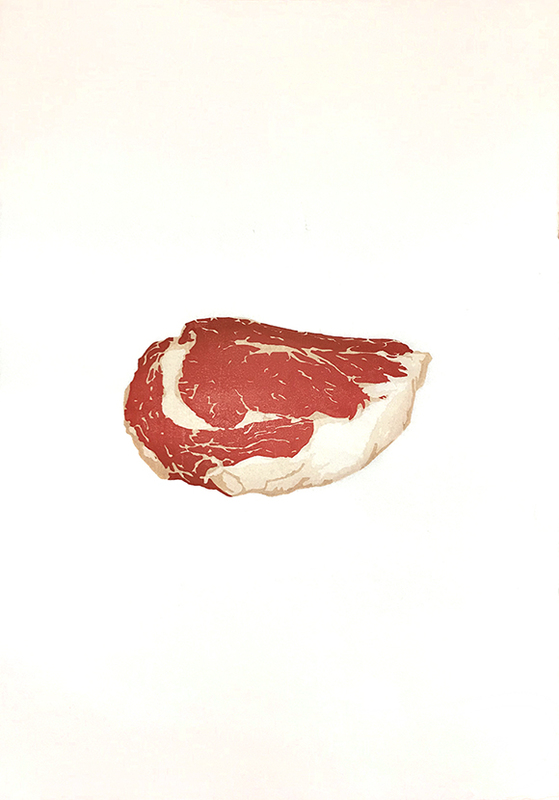 Conceptual art where the idea involves explanation/investigation needs a powerful visual trigger, and your slab of meat certainly fulfills that. I do miss your pithy and visually engaging texts as part of the image, however.